The Amplid Milligram caught my eye a couple of years ago because it promised to be the lightest production split board on the market. It was unproven, and I had my concerns about its performance and durability. After two full years of riding, I can say that the Milligram is easily the best, most versatile, and even one of the most durable splitboards I have ridden. Obviously, the weight is great when skinning or booting, but the very light weight also has a significant positive effect on riding performance. Me and the Milligram: I have been splitboarding for eight years and spend 40+ days per year in the backcountry. I ride in the Eastern Sierra of California in the winter and on the Pacific Northwest volcanoes during corn season. I’m 5’9” and 148 lbs. I love trying new gear, and have ridden quite a few split boards, including the Jones Solution, G3 Blacksheep, Prior Spearhead, Khyber, and BC split, Venture Storm, and a couple of Voiles. I have also ridden over 100 solid boards including split-related boards like Furberg, Gnu Billygoat, Venture Zephyr and Jones Hovercraft. 2015/2016 was the first winter the Milligram was available and there were not any in the US. Since I couldn’t see a board in person, I contacted Amplid and pestered them with a ton of questions. They were quick and responsive with their answers. In the end, I was curious enough to order one. After a year of riding and writing my thoughts about the Milligram, Amplid invited me to become an ambassador. They are the only company from which I would have accepted that offer. There are no other splits I wanted to ride, I really liked the Amplid crew, and I was excited about helping other riders connect with Amplid. I have now ridden Milligrams on about 80 days total in all conditions. My 158 has about 65 days and my 163 has about 15 days. My wife got one last season and has about 25 days on it. Amplid: Ampid is a German company owned by Peter Bauer. Peter is a multiple time snowboarding world champion who spent 16 years developing boards for Burton. He is well know for his parts in classic videos like Blizzard of Ahhhs and Scream of Consciousness. In 2005, Peter co-founded Amplid and in 2013, he became the sole owner. 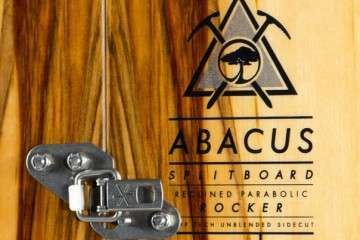 All Amplid snowboards are built in Austria at the Capita Mothership Factory. Construction: Both of Amplid’s carbon split boards, the Milligram and the new Millisurf have the same super light construction. Based on the weight, ride and durability, Amplid has clearly figured out some construction secrets. The boards are carbon, with no fiberglass except under the bindings, super lightweight core with reinforced high impact areas. With connector clips the 158cm Milligram weighs 2.5 Kg [5.5 lb], which is a pound or more lighter than most other carbon boards and 1.5 to 2.5 pounds lighter than most boards with traditional construction. The Milligram has a narrow strip of top sheet just around the perimeter of the deck to protect the carbon at the edges. Amplid calculates that this saves about half a pound over a full top sheet. I have not ridden this year’s Milligram or the new Millisurf yet, but I look forward to trying them soon. The Milligram is a lightly tapered directional free ride design in lengths from 153 to 168. A blunt nose provides additional float in powder. 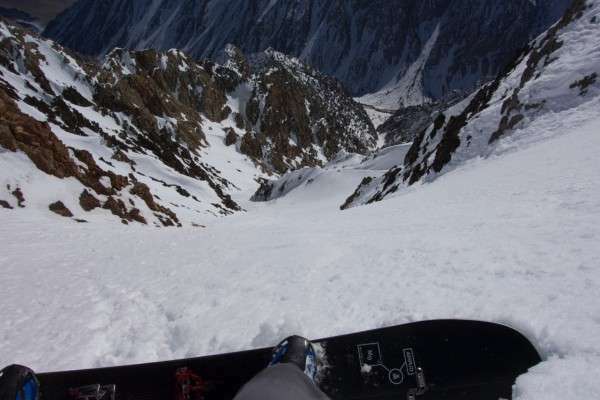 The width is typical of a free ride splitboard and Amplid added a 165 wide for this season. The Milligram’s camber runs from a bit behind the tail Karakorum clip to a point roughly in line with the nose Karakorum clip. After the camber ends, the nose radius curve is relatively gentle. The camber is not very high and presses out easily. The flex pattern is very smooth, with no sudden kinks. The Milligram is softer than a Jones Carbon Solution or a G3 Blacksheep X3, both of which I consider very stiff. It hand flexes a bit softer than the Jones Solution. It is noticeably lighter than any of them. The Milligram is really light! It is even lighter on my feet than I expected. I let my wife skin up with it when I first got it. Her response was “holy ****, holy ****, wow.” She had just come off a rather light 154 Jones Solution. Kick turns are very nice. Obviously, booting with the board on the pack is easier. It split skis well. 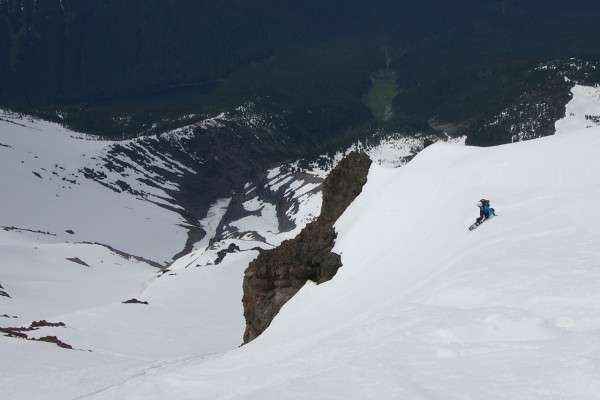 The low swing weight makes the skis nimble and maneuverable. In some conditions, the black carbon top requires additional management to keep snow from sticking. When transitioning I try to keep the deck and base from getting direct sun. On many days it is not an issue and I will take the 1/2 pound weight savings. For whatever reason, so many boards have dark top sheets anyway, the difference is not that significant. I have ridden the Milligram in every condition. Any discussion of splitboard weight usually centers around touring performance. The Milligram has shown me that that weight also influences riding performance. When riding, the light weight makes it much more responsive than other splits. It feels like a well behaved extension of my feet. The flex and shape feel balanced and solid, but sufficiently forgiving. When I push it harder, it gives right back. Transitions between snow types are smooth and the board does not get kicked around easily. Contrary to what I expected, the light weight (combined with other design elements?) actually helps me control the board in mixed conditions. In medium density powder, the board rides centered and has plenty of float. It surfs snow banks and wind lips really well. It has a clean bottom turn and a great release / slash off the top. In deep powder, I have always preferred true powder shapes. Predictably, for me, the 158 functions, but does not excel in legitimately knee deep medium density and lighter powder. I am stoked they released the Millisurf. On steeper, firm snow it is quick, predictable, and holds a solid edge. The Milligram comes around very fast on jump turns and steeper pitch turns when you want to quickly reengage your edge. That quickness really helps keep speed under control. The downhill slide after a jump turn is predictable and the board locks back in quickly. That responsiveness gives me more freedom to decide how to ride a line. The Milligram is such a versatile board and the light weight makes such a big difference both up and down that I have no interest in riding anything heavier. A primary concern was that a carbon board with a lightweight core was going to have a ton of feedback. I thought it might feel twitchy in some conditions and chatter in others. After lots of turns on crappy snow, I can say that feedback and chatter are not an issue. Another concern for the Milligram is that its light weight construction would sacrifice durability. The Eastern Sierra winter is hard on boards with all of its wind and granite. One of the boards I owned before the Milligram lasted about 20 tours before I broke it. On the Milligram, I have done plenty of riding over rocks, skinning over rocks, and any number of other mildly destructive things. It has held up beautifully. The edges and base have predictable rock damage similar to other boards I have owned. Aside from the one deep gouge from riding onto a hidden granite boulder (no core shots), everything else is minor scrapes. The top of the board has held up better than any split board I have owned. I asked Amplid about the durability difference between their standard fiberglass construction Creamer split (Milligam shape) and the Milligram. Gregor Common, head of sales, answered that there is no difference as far as they can tell. 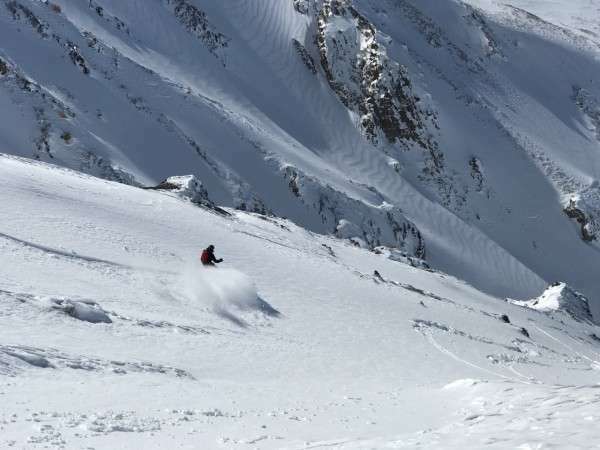 I asked some riders with a variety of styles and terrain preferences (mellow to very steep) and at least a season on a Milligram to share their thoughts. My initial impressions were wow, this board is light, coming in several pounds lighter than my other splits. When I told a few people that I’d purchased a carbon splitter, their immediate response was “you won’t like it.” The knock on carbon is that it rides too stiff and chatters a bunch. As it turns out, this is by far my favorite splitboard I’ve ever owned. The Milligram is a pleasure to skin being so light. I really notice the difference whenever I’m out on one of my other splits – they feel so heavy now. 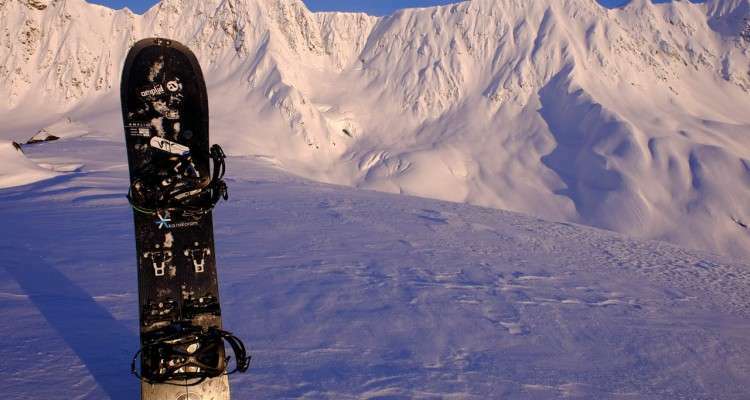 As for riding, the board slays powder with ease, and really excels in steeper, technical terrain. I find the flex to be just right (softer than one would assume for a carbon board), and jump turns are definitely easier due to the light weight. The board holds an edge well, doesn’t chatter at speed, and carves nicely too. So far, after a season of use, it is holding up nicely. I’m not seeing any durability issues, and in fact it appears to be wearing better than other splits I’ve owned. I’d definitely recommend this board to anyone who wants a high performing lightweight split. There are many things to love about the 158 Milligram split. On long Alaskan approaches the first thing I noticed was how effortlessly it glides uphill. Its super light weight allows you save your legs for the ride down. You don’t have to think twice about carrying it while booting up to the steep technical summit. Once you put it together you forget your riding a split. Weight is the only thing missing in this ride. It’s responsive in tight technical terrain, stable at high speeds, and super floaty fun in wide open deep pow! I’ve put my Milligram Split through every type of riding between Valdez, AK and Los Molles Argentina for three seasons and have yet to find conditions where it doesn’t excel. I have never been accused of being a weight weenie. My main concern has always been downhill performance. I wasn’t willing to sacrifice weight to gain a climbing advantage if there was any perceptible impact on my downhill fun quotient. And I don’t baby my board… and it gets abused a lot with late spring/early summer missions. I have to say… I am amazed. The Milligram is hands down the best split I’ve ever had, and I’ve had a lot of em. I didn’t think the weight reduction would have that dramatic of an effect, but it is insane touring with this thing. It really makes an obvious difference in how fast/how long I can tour. Touring now feels like a nice hike in the woods as opposed to kind of a slog in the woods. The board has also proven to be as durable as any other regular split I’ve owned, and I’ve bashed it into a few rocks. And most importantly to me, it rides great. And THAT I attribute to not only having a great shape and flex, but yes, also the weight. It just feels like a normal solid board, easy to swing around etc, not a heavy plank. I own a lot of splitboards that I like, and now the only one I want to take out is the Milligram. Even for the less-gnarly among us, the Milligram rocks. It is light and quick on the uphill, and it is hands-down the most fun, nimble splitboard of the six or so I’ve ridden on the down. I was initially hesitant to jump on the Milligram because I associated carbon construction with a stiff, unforgiving ride, best suited to a heavier, aggressive rider. But, oh wow, is this thing fun! It is playful and responsive in all conditions, even for a lightweight who is more finesse and flow than power and speed. When I feel like upping my game, the Milligram gives me the confidence to tackle steeper lines and variable conditions. freestyle/sidecountry riding to splitboard alpinism similar to what is practiced in places like Chamonix. However here in Alaska, I do not have the cable car access. Missions must be undertook on foot, from sea level upwards. After using other boards, including long radius designs, I felt the need for a lighter option to maximize efficiency on the uphill as well as offering a low swing weight for precise turns on exposed faces. I found that in the Milligram. The felt weight underfoot is incredibly light while touring or while carrying on my back. This means more energy for the primary objective, charging steep lines. Combined with a high performance split binding, karakoram’s, I feel a huge amount of confidence in my system while undertaking my dream lines!